As I tromped around Ft. Christmas looking for interesting rusting farm equipment I spotted these tiny pockets of mist in the grass. Upon closer inspection I discovered there were tiny spider webs strung from blade to blade of thick St. Augustine grass. I stood above it, I pointed my camera down, zoomed in as much as I could and stood stock still as I pressed the shutter. 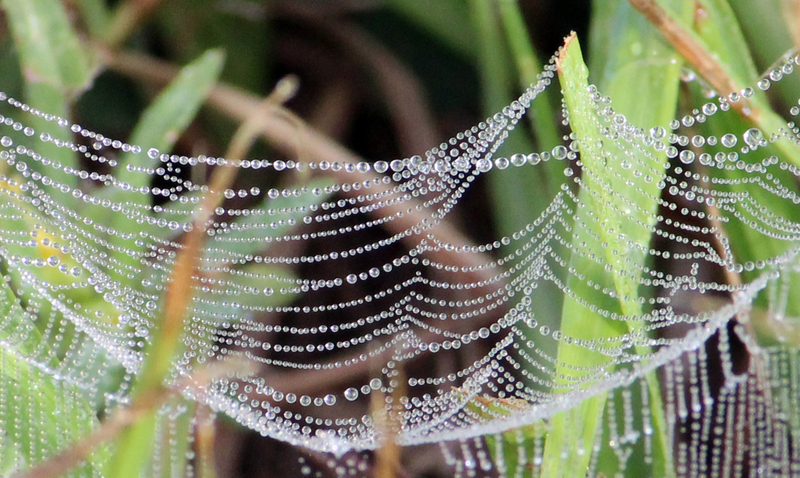 The result is an ethereal necklace of pearls made of the evening’s condensation and a very industrious spider. When I first discovered this upon moving to the west coast, I was truly amazed. It is amazing that such a tiny spider exists. This was found smack in the middle of Florida. They were everywhere, once I noticed the first one. So beautiful and intricate. Thanks for your comment.